Although sublimation is known for its commercial value, there is a multitude of ways we can use it in everyday creative projects. As an architect, home-owner, and even as a photographer or graphic designer, we are happy to push boundaries with your vision. 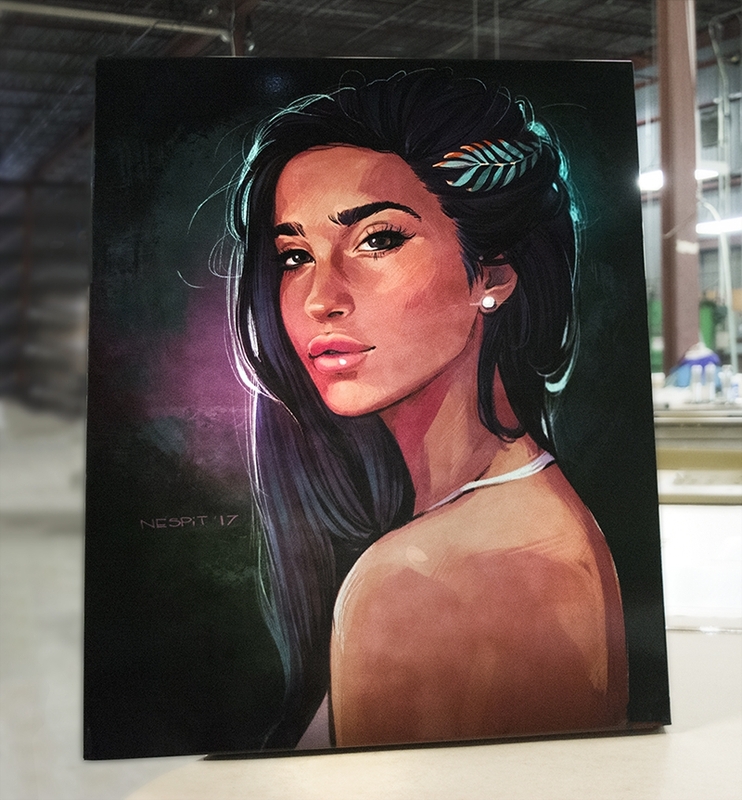 Instead of the ordinary canvas print, taking the medium to steel or aluminum has its benefits. With the choice of a metallic shine, glossy or matte finish, sublimation leaves a bold impression. Sublimation is a great way to make a durable and lasting print that is smooth to the touch and doesn't show fingerprints. Water resistant, UV-stable, and antimicrobial our prints are perfect for outdoor exposure. If you're looking for a smooth, lightweight and durable print option, this is the perfect choice for creatives and builders alike. The journey starts with you and the content you send to print. We open the files on our computer and send them to the printers. This file comes from an illustrator named Alexandra Pitaeva, whose beautiful illustration can be found here. We can sublimate 155 inches in length and 55 inches in width. Using special paper is important to the sublimating process, so that the image can be transferred to the material properly. With thick or thin options, our aluminum and steel sizes can suit your needs. The aluminum, or steel, is placed over your image to begin the image-transfer process. Once the image is held in place and ready to transfer, it goes under a silicon blanket and, into the oven where the ink will sink into the material. Once the material is out of the oven, the printed paper gets removed, revealing the transfer, which creates your print. The sublimation process ends with you. Your satisfaction with Decora sublimation prints is what keeps our company proud, and excited for future projects. Our team at Decora goes the extra mile to ensure you are satisfied.